We see them every year on election day – the ubiquitous “I Voted” stickers handed out after ballots are cast. Voters wear them proudly and share them widely on social media to encourage their friends and fans to get out and vote. But how can social media be used more deeply in elections and what are the pros and cons of going social? During elections, Facebook promotes voter turnout by adding an “I Voted” button at the top of user feeds. People click and get a “virtual sticker” to tell their friends and family members they’ve voted. In 2010, studies showed that was likely responsible for a small boost in voter turnout. However, it appears to have made little impact in the most recent midterm elections. But social media does make a difference when it comes to elections. An increasing number of Americans follow election results (for a variety of elections) through social media platforms like Facebook and Twitter. And nearly 30 percent of people use their mobile device to get that information on the go, according to a recent Pew Research study. 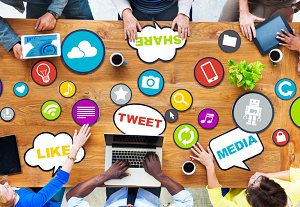 How can your organization capitalize on social media to boost election turnout among members? Social sharing buttons. When your organization holds an election online, make sure to include social sharing buttons at the end of the voting process. Members can tell their friends, family and fans on social media that they voted in the election. Not only does that build awareness, it’s a reminder and subtle push to other members so they vote too! Promote your election on your own social media sites. If your organization is on Facebook, Twitter, LinkedIn and other social media channels, you should absolutely be using those communication lines to promote election participation among members. Solicit feedback. Pay attention to social media channels and be part of the conversation members are having about your organization’s election. Make note of the praise and work to improve criticisms. Let members know you’re listening and, when possible, make their suggestions a reality. Read your organization’s bylaws carefully and be very cautious around your campaigning rules. Also, keep in mind the promotional rules of each social media platform you’re using. When you can make your organization’s rules line up with the benefits of social media, you can end up with more engaged members and increased participation in your elections. For more information on the pros of incorporating social media into your organization’s next election, contact us. Have you used social media promotion effectively in your elections? Let us know in the comments below.